You go to your family doctor with low back and leg pain and ask about seeing a chiropractor. "Oh, no," says the doctor," they'll try to pop it back into place which will not only be painful, but make matters much worse." Is this true? What is the chiropractic approach to treating a "slipped disc"? Chiropractic is conservative care, which means it is non-surgical and drugless. In treating low back "slipped discs", most spine experts agree that conservative care should be tried before surgery is considered, except in severe cases. Chiropractic care has a long history of successfully providing conservative 'painless' care for disc conditions - and no, chiropractors don't try to "pop a disc back in place". Click here for video, "What is a herniated disc, pinched nerve or bulging disc?". What is a "slipped" disc? 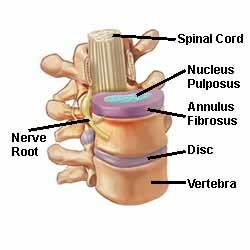 The disc is a circle of cartilage between each vertebra in the spine that acts as both a shock absorber and a shock distributor. If you jump up and down, imagine what would happen to the stack of bony vertebra that make up the spine without the cushioning of the discs. Move your back side to side. Again, you can visualize the give and take of the discs between the vertebrae. Without discs, the spine simply could not function. Discs don't really "slip". Instead, they degenerate by bulging, herniating, or rupturing. Saying a disc has "slipped" does suggest that something has "slipped out" and is not where it's supposed to be, which is what happens in disc injuries. Discs are made up of concentric circles or rings of fibrous material with a tough gelatinous center. When cracks or fissures occur in the fibrous rings, the gelatinous material in the center can begin to push out. A number of different factors may cause the disc to "slip". Does a sneeze cause a "slipped disc"? The low back "slipped disc" is almost always the result of a process. As is often the case with joint and back injuries, the problem starts small and then builds until it becomes symptomatic. It's a little corny to talk about "the straw that broke the camels back", but it gets the point across. For example, a patient sneezes and experiences sudden back pain that then proceeds to leg pain. However, the sneeze didn't cause the disc to "slip," but represents the final "straw" in a much longer process. Factors that precede the pain and symptoms of disc injury include disc dehydration, unusual stress on the disc secondary to disturbed mechanics, and too much load on the disc. Discs depend on water to keep their height and perform efficiently. When we're young, discs have their own circulation that helps keep them hydrated. As we get older, this circulation ends and the spine must move so that water can be drawn into the discs. If discs become dehydrated and lose their height, they become more vulnerable to cracks and fissures. Discs are integral parts of our body's mechanical system that allows us to move. Chiropractors are especially interested in seeing how injuries in one part of the body relate to the mechanical system of the body as a whole. Chiropractors look at injuries specifically, but they also try to determine in what way an injury is the outcome of disturbances elsewhere in the body. The spine functions as a whole, so if we have mechanical disturbances in one part of the spine, even as far away from the low back as the neck, it can influence conditions in another area of the spine. Imbalances in the pelvis, problems in the sacroiliac joints, low back facet fixations, as well as joint restrictions in the mid-back and the neck, can contribute to the process of disc degeneration and eventual injury. Disturbed mechanics from lack of muscular support or muscular imbalance are important because discs can come under more stress from weak abdominal muscles, or too much weight around our abdomen. The resulting hyperextension can cause a wedging of the discs. The opposite condition, hyperflexion, is caused when we round our low back because of weak back muscles or poor sitting habits. This causes stress on the disc in the opposite direction. Finally, if we put too much load on the back over a period of time, or occasionally in one dramatic episode, we can add another significant factor. A "slipped disc" most often occurs when a number of these and other factors act together to cause disc injury. For example, a middle-aged accountant who sits for long periods, suffers from disc dehydration, and has poor mechanics from weak abdominals, then lifts a heavy piece of furniture and experiences acute low back and leg pain. Or perhaps many months after lifting the piece of furniture, he experiences no pain at all until he sneezes. Bingo. A slipped disc. How do chiropractors diagnose what went wrong? What has happened to our poor accountant who now is experiencing acute back and leg pain? Apparently the cracks and fissures in his disc, the dehydration, the poor mechanics, the lifting - and perhaps even the sneeze - has caused the disc to slip just enough to press against the nerve that exits next to the disc. This has caused inflammation of the nerve, which can then cause pain along the path of the nerve into the leg. How does the chiropractor determine whether this is a "slipped disc"? Careful history taking, vital signs, and orthopedic and neurological testing are standards of practice in chiropractic offices. Are the reflexes intact? Is there loss of muscle strength or signs of muscle wasting? Is there loss of sensation along an area supplied by a particular nerve? These are vital questions that the orthopaedic and neurological exam can help answer. Chiropractors utilize other diagnostic procedures that are unique to chiropractic and establish the foundation for a program of care. Chiropractors look carefully at posture and perform a postural analysis of the patient. They use techniques such as motion and static palpation to determine exact areas of restrictions in spinal joint motion. They palpate muscles and perform muscle testing, as well as perform tests for pelvic balance and determine whether there is a "short leg". After analyzing this information, the chiropractor determines if the patient has suffered a disc injury. The crucial diagnostic question is, "what type of disc injury has occurred?" It is the answer to this question that will determine the chiropractic approach to treatment or referral. There are some patients who are not good candidates for conservative chiropractic care. For example, if there is suspicion of a cauda equina syndrome in which loss of bladder control accompanies a disc injury, this is a medical emergency not treated by chiropractic. If there are unusual neurological findings with advanced loss of strength, sensation, and reflexes, the chiropractor will refer the patient to a spine surgeon (spine specialist) prior to initiating conservative care. Most disc conditions do not fall into these more extreme categories. The great majority of disc injuries involve some degree of bulging of the disc. The "slipped" disc can be a slight, even temporary, push against the nerve or the spinal cord, or it can be a more definite mild, moderate, or marked bulge. 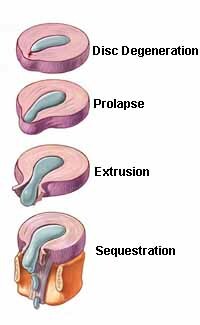 Frank herniated discs occur when a fragment from the central part of the disc breaks completely through the fibrous rings. Whatever the category of disc bulge, the low back pain, leg pain, and muscle spasms require examination and, in most cases, a period of conservative, non-surgical care prior to any consideration of surgical intervention. What is the chiropractic approach to conservative care of the disc? First we should address a misconception. Chiropractors do not attempt to "pop a disc back in place" with forceful adjusting or manipulative techniques. There is a form of disc insult to a nerve with low back instability, often resulting in a quite dramatic lean of the low back with spasm that responds well to traditional chiropractic adjusting. However, all other disc conditions are treated in chiropractic with a gentle program of low-force techniques. Another misconception is that chiropractic care involves a few quick treatments, again usually seen as popping the back, which will fix the disc. Instead, chiropractors who treat disc conditions integrate their low force adjusting techniques in an organized protocol of evaluation and treatment. At Advanced Healthcare, Dr. Pisarek not only utilizes various non-invasive spinal manipulative therapies (SMT); but also incorporates low-level laser therapy (LLLT), stretching and strengthening exercise routines, nutritional support and lifestyle modification behaviour techniques. Throughout a program of chiropractic care for disc conditions, patients are asked questions regarding their progress. Evaluation of progress using neurological and chiropractic tests based on comparison with the initial findings are essential aspects of this chiropractic protocol. If a patient is not responding to conservative care using this protocol, the chiropractor will refer the patient for imaging studies and spine specialist consultation. What are chiropractic "Pelvic Blocking" techniques? Chiropractors use pelvic blocking techniques as part of another low back disc protocol. This technique is referred to as 'S.O.T.' which stands for sacro-occipital-technique. Under a blocking technique, disc patients are categorized according to a set of findings including traditional orthopedic and neurological testing. Dr. Pisarek is trained in the use of pelvic blocking techniques. Treatments using pelvic blocking techniques include the use of cushioned wedges, which are placed under each side of the pelvis along with gentle maneuvers. This allows gravity and changes in mechanics to draw the disc away from the nerve. Disc injuries are treated in a series of non-force treatments with monitoring and evaluation. If subjective signs and symptoms are not improving, referral for imaging and spine specialist referral are standard of care. Chiropractors are holistic doctors (Complimentary Alternative Medical providers, abbreviated CAM) and even specific conditions, such as a "slipped", herniated, or ruptured discs, are treated in a whole body context. The chiropractor considers stress and nutritional and lifestyle factors, especially as they relate to pain perception and reduction of inflammation. Conditioning and exercise, stress management, and improved nutrition and eating habits are all considered when the acute phase of pain and inflammation has been resolved. The low back disc is always seen in the context of the spine as a whole. In addition to addressing the lower back, Dr. Pisarek addresses possible spinal joint restrictions in the neck, mid-back, and extremities that may need correction. Manual adjusting techniques can be used successfully in the neck and mid-back, while the low back is addressed with low force techniques. Call Advanced Healthcare for an appointment to determine if we can help you!